This is the Lebron James made a statement, as quoted by ESPN, got many of his apologists clapping and his detractors raise their arms. He was referring to the Cavaliers’ 2016 NBA championship where Cleveland fell behind three games to one to the 73-9 win Warriors and had to rally to win the last three games that includes two in Golden State to give the Cavs its first title in 52 years of existence. James registered a triple double: 27 points, 11 rebounds and 11 assists in a 93-89 Game 7 win to seal it. He was voted the unanimous MVP in the series, the third Finals MVP of his career. I went skeptical when I first heard it. 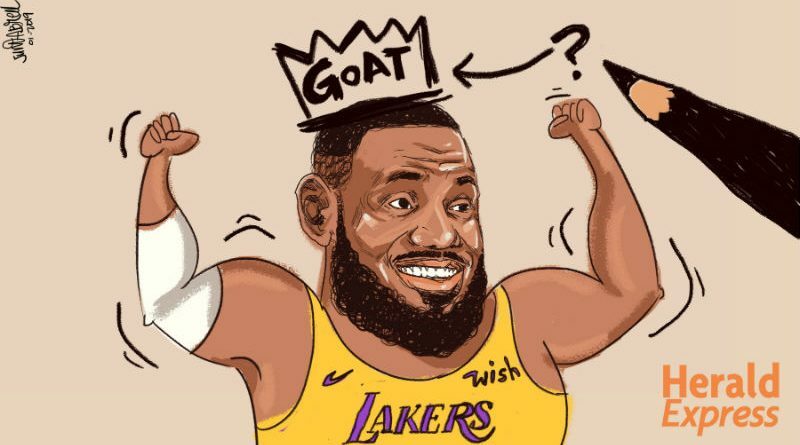 I can’t seem to agree that being the GOAT is about a championship in one year where one beats a team with the best regular season record of all-time by overcoming a 1-3 series deficit to give a franchise their first title in 52 years of NBA participation. It’s gotta be more than that. I mean, the Warriors were themselves in a 39-year woefulness before Stephen Curry led the team to end it with a title over the Lebron James-led Cavs in 2015. Does that alone make Curry the GOAT? No, but it helps makes his case. Pondering on it later, I kinda see two angles why James may think he’s the GOAT: (1) the roles he had to play (more of forced to rather than had to) since joining the Cavs and (2) the obstacles he had to overcome that year to ending the long title drought. Maybe what James is alluding to is how he had to play team superstar, coach, and general manager to change the winning culture of the Cleveland Cavaliers and how he had to overcome a great team to get it done. Well, this “GOAT” thing to me is really highly subjective. There are many factors to consider in bestowing that title to an individual. Just consider some of these: Career stats generated, skills, court savvy, contribution to team success, leadership, franchise impact, etc. Generally, these criteria, except for stats and trophies, have no general means of measurement. It’s not as easy as who scored more over his career or who averaged more points during his career, etc. It would be difficult to find a set of evaluators who will all have the same scoresheet when voting for something like this. So, are we going to take his word about being the greatest of all-time based on his criteria? Well, he has a point for one. What he has done: to overcome a seemingly basketball loser owner, to impact building the team roster, impact the hiring of the coach, and getting to lead the roster on the floor to win a championship that will end a 52-year title drought is one tough task. It should be noted though that he had to endure losing first before finding success. He missed the playoffs during his first two seasons before taking off in the next five that includes a finals loss to the Spurs and an Eastern conference finals loss to the Orlando Magic. He did decide to take his talents to Miami to join forces with Dwayne Wade and Chris Bosh that resulted to four final trips and two trophies. Now armed with the experience, he would go back home and build a similar thing in Cleveland (notice how the eerily similar the line-ups are, which James hand a hand in building: Kevin Love/Bosh, Wade/Kyrie Irving, Tristan Thompson/Udonis Haslem, JR Smith and Kyle Korver/Allen and Mike Miller, Richard Jefferson/Shane Battier) that resulted to another four trips to the finals and that memorable championship. It should be likewise noted that the moment he left these teams, they become immediately bad, although Miami did loss also Wade to free agency and Bosh to injury and Love is constantly hounded by injury this year for Cleveland. His main supporting cast: Wade, Bosh, Allen in Miami, Love and Irving in Cleveland. Contrary to his only pointing of the 2016 championship, it would be the totality of these accomplishments plus his career statistics that should make him a candidate for the GOAT under the impact to franchise criterion. This is one aspect that James is forgetting. Even basing it on the criteria he set, others have done similar great things on the basketball floor that could definitely rival what he’s done. Let’s take the first criteria he set: impact on the franchise. I am skeptical about his being the GOAT because his situation was not really that different when compared to others, Michael Jordan, Larry Bird, Bill Russell, Magic Johnson, Curry, etc? Caveat 1: Not everybody is handed a situation of ending a 52-year title drought so it would not be fair to put premium on the failures of others to raise one’s glory. Let’s approach this comparison by analyzing how a player impacted his franchise upon arrival. I agree it’s difficult to change a team culture that has an owner who is allergic to winning and investing more resources in the right players. But this doesn’t take away the fact that it is equally difficult to win a championship when the front office selects the players they prefer, hires the coach they want and the superstar has to lead them on the floor. So when a superstar has to play along with whatever teammates the front office gives them, play under the coaches’ systems and plans, and produce championships, it is as special as what he has done. James should have an advantage that he chose who to play with and for. I think this case is even more challenging for the other case because they are forced to play with somebody they may not wish to play with. Nevertheless, either cases doesn’t diminishes, or enhance how a championship was won over the other. It is not Curry’s, or Jordan’s, or Bird’s fault that they were handed a situation more favorable than a 52-year championship drought. The important thing is they did exactly what they had to do for the franchises they belonged. Caveat 2: I have Jordan and Bird as my top two “Most Valuable Players of All-Time” so far, so allow me to cite their cases first. For the record, I Have James as my best small forward of All-Time because he owns the counting stats due to longevity and has super athletic skills but still consider Bird and his court savvy and leadership more valuable to his Celtics rather than James to the Cavs or Heat. The Lakers’ case this year is interesting. I reserve my right to change my mind after seeing how he impacts this Lakers’ franchise as it stands. Let’s talk of the obvious first. The Warriors’ last championship before their 2014-15 win was 1974-75. Since that championship, the Warriors made the playoffs only 10 times during the next 39 years where they were eliminated thrice in the first round and six more times in the Western Conference semis. They lost in the conference finals in the other one during the year immediately succeeding their championship win. So what did Curry do? He had to endure missing the playoffs in his first three years that includes an injury plagued third season and playing backseat to then Warriors main guys Monta Ellis and David Lee. When he was handed the reins, he did took over to become the team’s face and sent it flying high with six straight playoff appearances, four final trips, and three trophies. His main supporting cast: Kevin Durant, Klay Thompson, and Draymond Green. We all know this story is still in progress. Chicago was also titleless in 18 years of existence before Jordan arrived. So what does Jordan do? He turns the Bulls into horses over time! He starts gliding with finesse in the air, usually leading the team in scoring and single-handedly giving hope to the Bulls’ reaching the playoffs but had to endure three straight first round exits in his first three years. Two more semifinal exits and a conference finals loss followed. Then when it came time to take over the league, he did just that. He found a way to break the “Jordan Rules” of nemesis Detriot Pistons to give the Bulls their first NBA finals appearance and everybody knew how this story ended: the Bulls won their six championships during the next eight seasons, the only ones to date. Mind-refresher, Jordan retired and played baseball for almost two seasons, returning to basketball after mid-season in the second year. After Jordan left for Washington, the Bulls never had any at least resemblance of at least a part of that success until this day. His main supporting cast: Scottie Pippen, Horace Grant/Dennis Rodman. Boston has already accumulated a case of trophies prior to Bird’s rookie season but they were clearly not the same team that won 13 titles immediately before he arrived. They, in fact, have just registered a 29-53 regular season record the year immediately prior to Bird’s arrival, 61-103 in combined two years. Well, here’s where Bird is different for the first three superstars. He made his impact immediately felt at the get go. They ended up losing in the Eastern Conference Finals that season. He would then lead the Celtics to eight Eastern Conference Finals appearances, five Finals appearances and three NBA titles in his next nine years. It would probably been five if not for the unfortunate timing of Bird’s NBA career where he had to deal with the Magic Johnson and the Lakers in the finals three times. The Celtics never missed the playoffs during Bird’s entire career. They suddenly go south pole immediately after his departure, missing the playoffs nine times and exiting in the first round four times in the next 16 years. The do not reach the NBA finals again until the new Big Three won another one for them. In my opinion, James’ impact on Cleveland was not really that different with the impact of Jordan in Chicago and Bird’s on Boston and how Curry is impacting the Warriors today. What all four achieved in relation to what state their franchises were in prior to coming were all equally super, super special as he said. And these are just only three of the other superstars he has to contend with for the GOAT title.